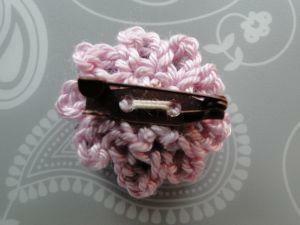 Make a pretty brooch made up of three crocheted flowers. 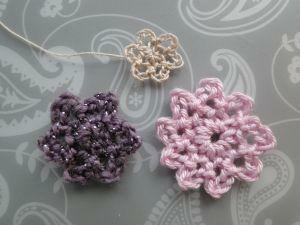 Use any combo of yarns and hooks to make your small, medium and larger flower. 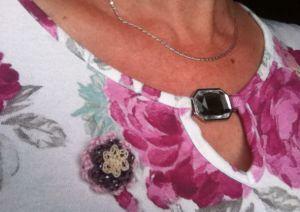 You'll also need a brooch pin. Basically, you need three different yarns of three different weights - one a lighter weight, the next a heavier weight, the third a heavier weight still. Each flower starts with a magic ring. If this is new to you, see my info about it here. 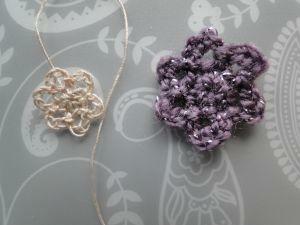 Make your smallest flower with your lightest weight yarn. Follow the pattern for Anne's Fleurette. Make your middle flower with your next heaviest yarn and weave in the ends. 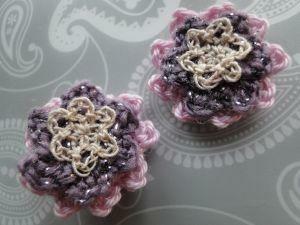 For the third flower, I crocheted the same pattern but with 9 petals. 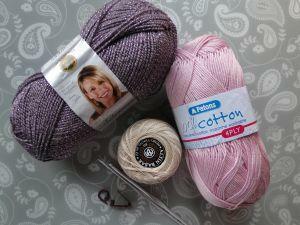 This is worked in your heaviest weight yarn. Round 1: Chain 1. You will make a slip stitch into this at the end. Use a stitch marker if you need to keep an eye on it. 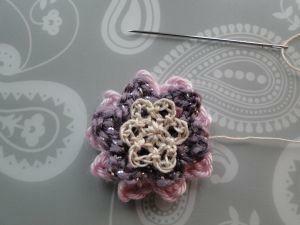 (Chain 4, slip stitch into next stitch) all the way round to make 9 petals. Weave in ends. Thread your needle with the tail end at the back of the smallest flower and sew through the middle of the each of the flowers. 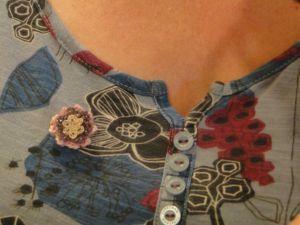 Then sew a couple more times up and down the center of the flowers to join them firmly together. 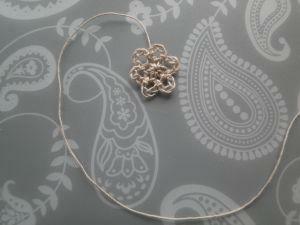 For those of you making the Fleurette Necklace, stop here and return to that tutorial to make your necklace chain!